The nostalgia train rolls along in Elder Scrolls games. The Elder Scrolls Online got a Morrowind expansion last year, and soon it will be The Elder Scrolls: Legends‘ turn, as the Houses of Morrowind expansion goes live on March 28. 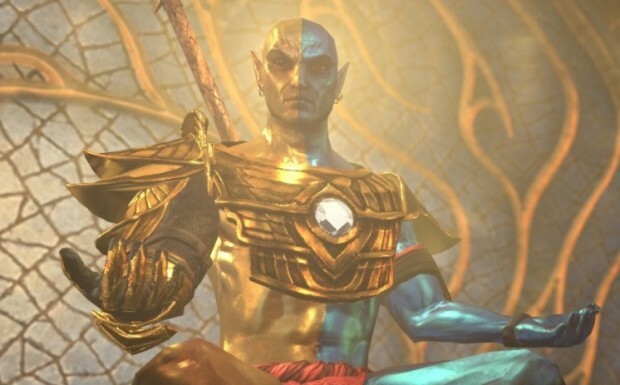 This expansion adds 140 new cards to the game, asking players to pledge their allegiance to one of Morrowind’s five great houses and face down the living gods of Morrowind themselves, along with their nemesis, Dagoth Ur. Doing so will unlock the potential of three-attribute decks, which come with an increase in maximum deck size to 100 cards. Each of the five great houses — for you lore-obsessed Morrowind fans, that’s technically four great houses (Hlaalu, Redoran, Telvanni, Dagoth) and the Tribunal Temple — has with its own keyword and bonuses that represent that house’s strengths and goals. You can check out the announcement of the set, along with seven cards, on the Legends’ website.